The Peloponnesian League was an alliance of states in the Peloponnese region, first organised and masterminded by ancient Sparta. The goal of the Peloponnesian League was to form strategic and beneficial alliances, allowing the involved states to build strength, security and power. The Spartans at the height of their power were keen to not only be at war and keeping their state safe, but to also be at peace. The Peloponnesian League was created to allow this to happen, the strength of the aligned states would act as a natural deterrent in a volatile ancient world. The Peloponnese is a peninsula in southern Greece. A peninsula is simply a piece of land that is bordered on 3 sides by water but still has a connection to a main piece of larger land. The Peloponnese peninsular was home in Ancient times to the most feared fighters in all of the Ancient Greece, the Spartans of ancient Sparta. With the the close of the 7th century drawing in, the state of Sparta was now a force to be reckoned with. Sparta had crushed the Messenian revolt and was now looking ahead for defence against the newly formed Delian league. The Delian league was formed by Athens where they offered protection to smaller cities from the imposing Persian forces, in return the smaller cities would be allies of Athens in times of hardship and war. Therefore the reaction of Sparta was obvious, they did what they typically did best and copied the status quo with more effort and organisation, leading to the foundation of this new league. Sparta was the founder of the Peloponnesian league, its king at the time Cleomenes I was a superb tactician, and was a key factor in the foundation of the league. With the rising of the Delian league with Athens as the key component, Sparta and king Cleomenes set in motion a rival that would allow them and anyone else like the state of Corinth, who were themselves dissatisfied with the Delian league to form a suitable alliance, for future safety and stability. With the Peloponnesian League being founded in opposition to the Delian, it’s no surprise to find that various elements of its structure and membership were different. Firstly the league had no membership costs, the tax of the Delian league was a sore point for various states, and the Spartans were astute to not repeat this mistake. The Peloponnesian League also allowed each member a single vote regardless of the size of the state or the number of its people, in many ways the Peloponnesian league was much fairer and more of a co-operative than the rulership of Athens and the Delian league. In times of war however there was a stipulation to membership for everyone in the league, and this was that when required, each member would be willing to donate a third of its current army to the Peloponnesian League’s cause. The need for this was obvious and also fair, no state would have to commit all its forces regardless of size and a sizeable army could still be created should a need for it arise. As enemies of Athens and the Delian league, Sparta looked toward their own league to offer power, protection and the survival of the Spartans. Sparta was also at odds with one of the other big players in the Peloponnese, Argos. To this end, Sparta’s primary goal in the league was self preservation and prosperity. The major players in the Peloponnesian League that we are aware of consisted of Sparta, Corinth, Kythira, Melos, Pylos, Mantinea, Ellis, Epidaurus, Boeotia, Lefkada and Ambracia. While this is what we believe to be the correct membership, due to the time and date of the Peloponnesian League formation it’s impossible to be one hundred percent certain. For example many people believe that Macedonia was part of the Peloponnesian League, while others refute this claim with Macedonia not being clearly on any one side of the conflicts. The start of the Peloponnesian League collapse began after the hard fought but ultimately lost battle of Sparta, when the Spartans were defeated by Thebes in the battle of Leuktra. 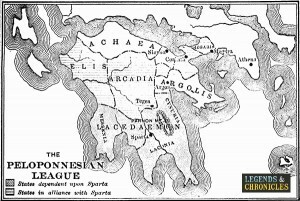 With the once powerful Spartan state weakened many took advantage to shift control, including Arcadia who combined to form the Arcadian League. Others members who initially remained loyal to the Peloponnesian League later had no choice but to side with Thebes or become neutral and around 338 BC the Peloponnesian League ceased to exist.